This is a great time for anyone looking for a new smartphone or tablet -- or to switch from one wireless carrier to another. That's because the big four U.S. telecom companies are pummeling each other silly with price wars and discounts on new products. Check out some of these offers on Twitter. Sprint (S) is asking people to "Bring us your Verizon or AT&T bill. We'll fire up the chainsaw and #CutYourBill in half!" T-Mobile (TMUS) recently tweeted, "Fa-la-la... oh forget it. The Note 4 is at @Tmobile for nothing down right now! GO GO GO! Ma Bell is urging customers to "Switch to AT&T & Get a $150 Bill Credit with AT&T Next line." And Verizon (VZ) is touting this. "Huge 16MP camera. Tiny price. Get the Samsung GS5 for $199.99 w/ $50 mail in rebate (2yr activation req'd) #GoodMore"
Dial P for Plunging Prices. All this good news for consumers is terrible for anyone that's investing in the big wireless companies. Verizon warned earlier this week that promotions would hurt its fourth-quarter profits. And AT&T (T)chief financial officer John Stephens said at an investment conference this week that "you're seeing pricing competition, you're seeing promos. The marketplace is very, very competitive." That led investors to quickly hang up on telco stocks. 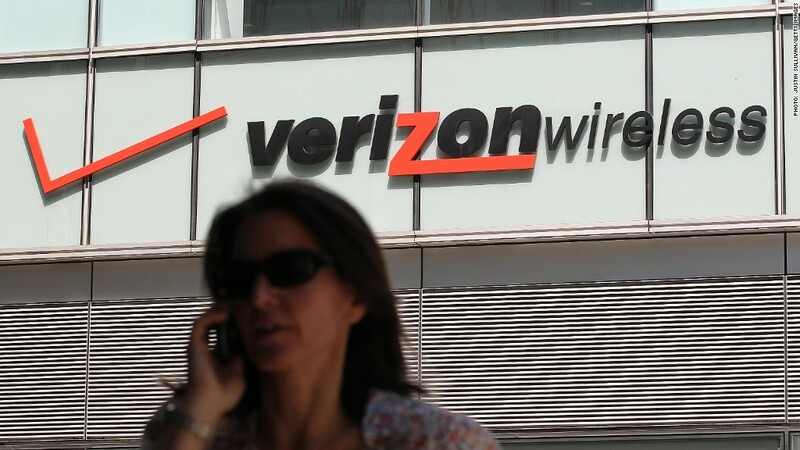 Shares of Verizon plunged 6% this week. AT&T stock fell 5%. T-Mobile plummeted 10% while Sprint has dropped more than 16%. The wireless companies are now starting to behave like the airlines used to do. Remember when the airlines were all unprofitable messes moving in and out of bankruptcy? It's not that bad for the telecoms yet. But the wireless carriers are clearly more interested in subscriber growth than profits right now. That typically doesn't end well. Desperate times. It doesn't look like anything is going to change in the near future either. Sprint had hoped to buy T-Mobile in order to become a more formidable competitor against Verizon and AT&T. But it walked away from those discussions as it became clear that U.S. regulators would not approve of a deal. Now Sprint is leading the way with aggressive price discounts. The company has a new CEO who realizes that he has to stop the bleeding in subscribers or the stock price will never turn around. Shares of Sprint are down 60% this year even though the company has the backing of Japanese tech giant SoftBank (SFTBY). T-Mobile is also doing everything it can to gain market share. The company just unveiled a new family plan this week that promises 4 lines for $100 with 10 gigbabytes of 4G LTE data. Its CEO John Legere has branded T-Mobile as the "uncarrier" and he seems to take personal pride in bashing his rivals, especially on Twitter. But this has failed to impress Wall Street. T-Mobile's stock is down nearly 25% in 2014. All of these things are just like the other. As long as Sprint and T-Mobile are cutting prices, that puts pressure on industry leaders Verizon and AT&T to do the same. Because let's be honest: Price is really the only major differentiating factor between the four. Sure, some carriers have better networks than others, especially depending on where you live. But the wireless companies are focusing their marketing more on price than service quality these days. When's the last time you saw the Verizon guy saying, "Can you hear me now? Good." in an ad? Apple (AAPL) is partly to blame as well. 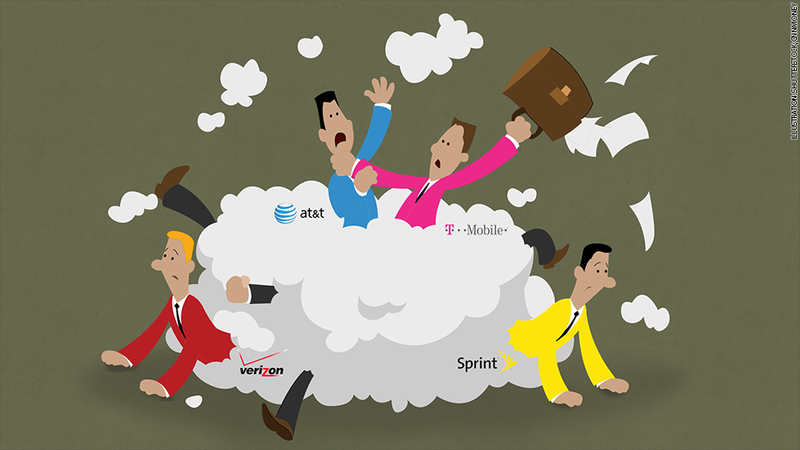 It's no longer playing favorites in the wireless industry. You can get an iPhone 6 from any of the major carriers. AT&T's Stephens acknowledged that this week, saying that this is the first year when all four top carriers have the latest iPhone. Beyond Apple, just about every other smartphone and tablet all look the same and pretty much do the same things as well. It doesn't matter if you're one of the iFaitfhul, a fan of Samsung, LG or other hardware companies relying on Google's (GOOGL) Android or even a Microsoft (MSFT) devotee. You can get any of these devices from any of the Big Four wireless companies. So why not search for the cheapest deals? Add that up and it's a recipe for more pain for the telecoms ahead. Reader Comment of the Week! I am a Yankees/Giants/Nets/Islanders fan. So it hurts my pride to praise someone with allegiances to the Sawx, Pats, Celtics and Bruins. But one of my favorite Twitter followers is Christian Koulichkov, a guy who goes by the handle of @BostonBroker33 and has a photo of evil Bill Belichick in his trademark hoodie as his Twitter icon. Christian will be one of the charter members of the Buzz Reader Comment of the Week Hall of Fame. Hope to break ground on the museum in Brooklyn next year. Maybe I should talk to Bruce Ratner for some help. Anyway, Christian has won the RCOTW award numerous times. And he gets it this week because he pays attention to what I tweet. He combined my love of a certain online travel stock known for its famous pitchman and my recent series of stories chronicling the demise of a once-proud retailer. "@LaMonicaBuzz it's ok to short the Shack but not the Shat. Let that be a lesson to the kids out there. $RSH $PCLN"
Nice! Shorting RadioShack (RSH) would have made you a lot of money this year. Although Priceline (PCLN) is down a bit as well lately. Will the Negotiator come to the rescue in 2015?